Chobe National Park is not only the second largest national park in Botswana but also boasts as one of the greatest concentrations of game in Africa. The Park is divided into four sections, the Serondela area, the Savuti Marsh area, the Nogatsaa and Tchinga, and the Linyanti Marsh. Chobe National Park, located on Chobe River in the Northern region of Botswana and bordering Moremi Game Reserve in the south, has one of the greatest concentrations of game found on the African continent. By size, it covers 10,566 sq km making it the third largest park in the country, after the Central Kalahari Game Reserve and Gemsbok National Park. However, of the three parks, it is the most diverse. 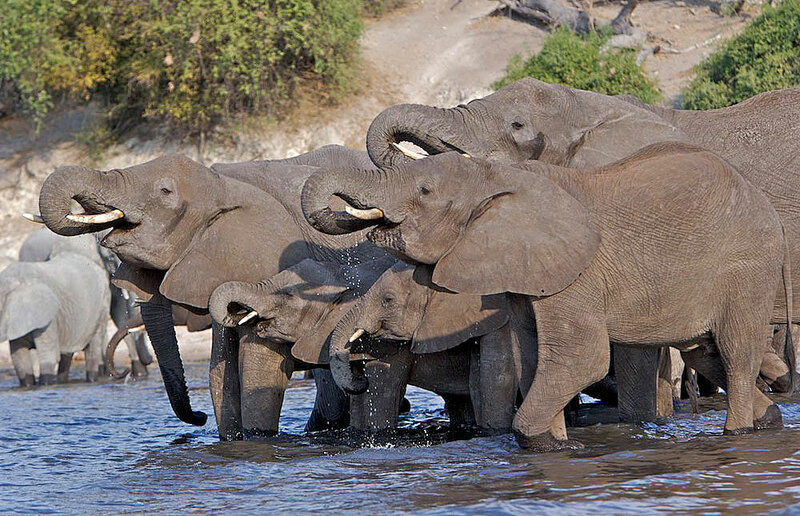 Chobe was Botswana’s first national park and is impressively famous for its immense numbers of elephants. The Park has arguably the largest Elephant population in the world and is home to great numbers of other game species. 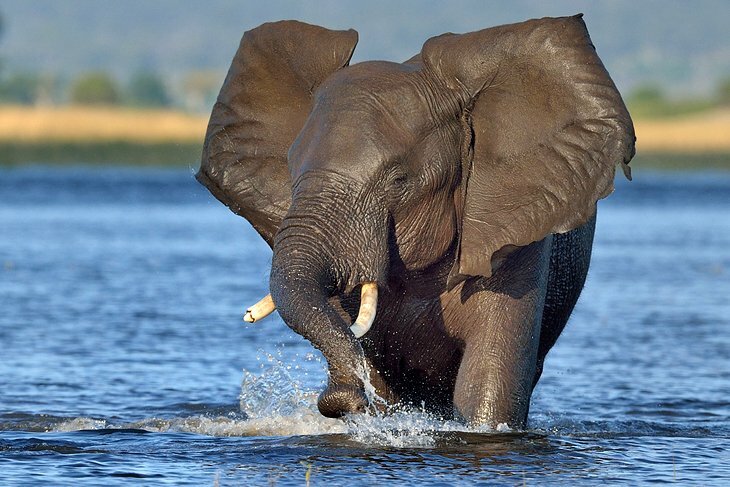 The wide Chobe River is the lifeblood of the area and feeds adjacent floodplains much loved by Elephants. The Park covers a variety of the country’s riverine forest including floodplains and the mopane and miombo woodland. Serondela area with its lush plains and situated in the extreme Northeast of the park. The area is covered with extensive savannah and rolling grasslands, which makes wildlife particularly dynamic in this section of the park. Serondela is also reputed for its annual migration of zebras and predators. This is probably the most visited park section, partly due to its proximity to the Victoria Falls. The Linyanti Swamps located at the North-west corner of the park and to the North of Savuti is adjacent to Linyanti River. To the west of this area lies Selinda Reserve and on the Northern bank of Kwando River is Namibia‘s Mamili National Park. Close to these 2 rivers are riverine woodlands, open woodlands plus lagoons, while the rest of the region mainly has floodplains. Prominent are high concentrations of leopards, lions, wild dogs, Roan antelopes, Sable antelopes, and hippopotamuses. Hot dry hinterland; Bird life is very rich here. The Savuti Marsh in the west about 50 km north of Mababe gate. The rare red lechwe, sitatunga or crocodile also occur in the area. Adventurous travelers who desire to experience a large-scale migration of animals you must visit the Savuti Marsh. It is renowned for its annual trek of zebras and predators. Chobe National Park said to be a natural world lover’s haven particularly between May and late September (the dry spell), has immense herds of Buffalo, Eland, Giraffe, Impala, Lechwe, Oribi, Roan, Tsessebe, Waterbuck, Wildebeest, and Zebra that can be observed more easily. In other words, the animals are superbly visible especially when the foliage has reduced. Such a multiplicity of habitats attracts a variety of the natural world. Game drives in the Chobe National Park offer excellent game viewing opportunities. Cruise down the Chobe River in a luxury safari boat. In the dry season, Elephants congregate by the river in enormous numbers with the riverside area offering magnificent bird viewing. Predators like Leopards and lions are common figures in Chobe National Park; similarly, there are several Hippos and Crocodiles in Chobe River. Wild pig, baboons, and monkeys also make Chobe National Park their habitat. Birding is amazing especially when the migrant birds come between late November to late March. It is such uniqueness in abundance of wildlife that makes Chobe a true African safari nature deservedly to experience in anyone’s lifespan. There are no fuel supplies available within the Chobe and therefore tourists traveling between Kasane and Maun should be prepared with fuel to take them through the whole journey. Chobe National Park’s basic attraction is its elephant concentration. You have not experienced the true African elephant on a Chobe safari. Although Botswana is virtually most popular for its exotic wildlife concentration, it also remains one of the most popular destinations in Southern Africa and Africa at large for Botswana bird watching adventures. Most of the National Parks in the country is a hot spot for those who desire to feast their eyes and ears with chirping birds. Botswana cut across most of the Safari Packages in the country. Botswana is the home to a record 575 species of rare and endangered species of birds (Both migratory and resident birds). Just some of the Botswana bird life to be seen includes the Cattle Egret (the National Bird), Slaty Egrets, Storks, Ibises, Spoonbills, Flamingos, Endangered Wattled Cranes, Pel’s Fishing Owls, Ostrich, Gray Go-Away-Bird, Malachite Kingfisher, Kori Bustard, Red-Billed Quelea, White-Backed Night Heron, Short-Clawed Lark, African Skimmer, Rock Pratincole, Swamp Boubou, Honey-guides, Hammerkop, White-Backed Vulture, Cape Griffon, Secretary-Bird, Blue Crane, Blue-Cheeked Bee-Eater, Black-fronted Bush-Shrike, Robert’s Warbler and Peach-Faced Lovebird. The Nata Bird Sanctuary is located 170km northwest of Francistown and 20km south of Nata and the eastern tip of the Makgadikgadi Pans. Nata Bird Sanctuary is the only protected reserve of the area where a variety of species of birds and mammals can be seen. 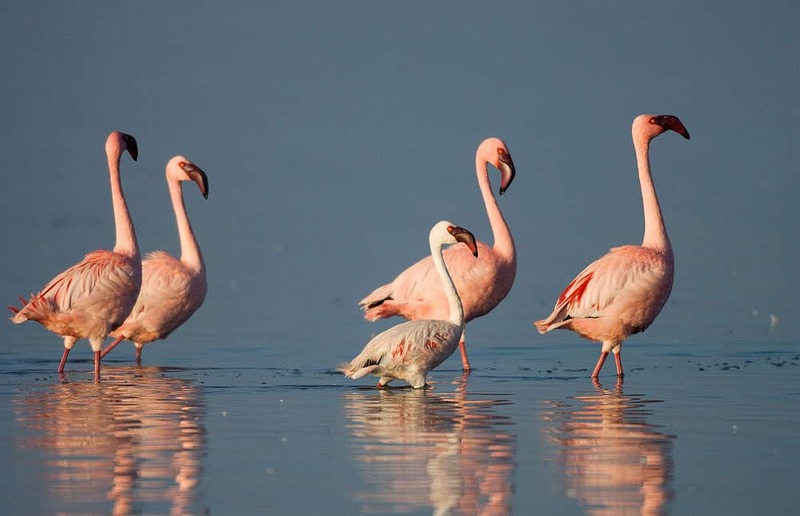 The bird sanctuary has about 165 species of birds; the Lesser and Greater Flamingos, Great White Pelican and Pink-Backed Pelican are the most dominant species, they arrive annually in large numbers as part of their migration during the winter season. (Nata Bird Sanctuary is one of the largest breeding sites of lesser and Greater flamingo in the world.) The lesser flamingos feed on algae and are plentiful in the warm shallow waters of salt pans. Other notable bird species include Avocet, Black-Winged Stilt, Blacksmith Lapwing, Cape Teal, Kori Bustard, Martial Eagle, Black-Necked Grebe, Bustards, Geese, Korhaans, Carmine, Darters, African Fish Eagle, Pied Kingfisher, Black-Chested Snake-Eagle, Blue-Cheeked Bee-Eater, Red-Knobbed Coot, Secretary Bird, Spoonbills, and White-Faced Whistling Duck. Nestled in between the sheer cliffs of the Manyelanong Hills, Manyelanong Game Reserve is one of the celebrated birding spots in Botswana. Although small in size, the Reserve protects a breeding colony of Cape vultures. It is this protection of the cape vultures that to the list of the destination for Botswana Bird watching Packages. The vultures are usually seen flying about the area and when in season, the young birds are sitting on the rocks. Today there are just fewer than 70 breeding pairs of birds in the colony, but it still counts as one of the largest colonies of vultures in Botswana. 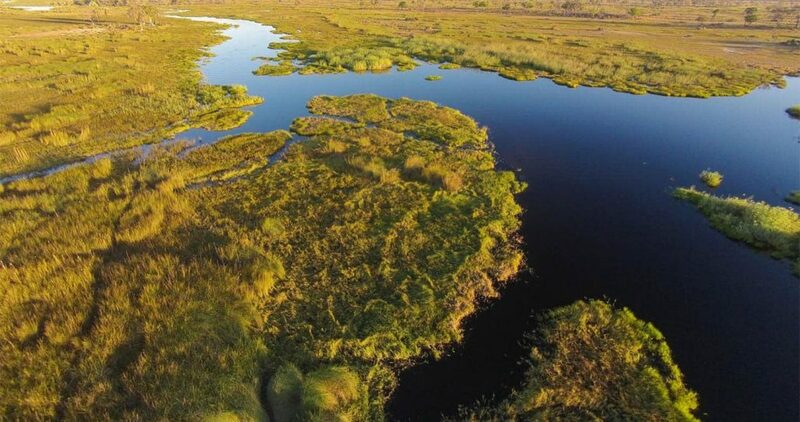 The Okavango Delta is the world’s largest inland delta and a remarkable bird sanctuary. A total of 450 species of bird have been recorded in the Delta. It is also a much-preferred destination for the migratory birds such as the African Fish Eagle, Scared Ibis, and Crested Crane. Significant numbers of wetland birds occur in the delta swamps, notably the Herons. Several other resident bird varieties found within the Delta include Marabou stork, White-breasted Sunbird, White-headed Black-chat, Sharp-tailed Glossy-starling, Angola Babbler, Barred Wren-warbler, Bradfield’s Hornbill, Racket-tailed Roller, etc. Most of the species occur in exceeding numbers. The Makgadikgadi Pans National Park is situated in north-eastern Botswana. It is home to some of the world’s largest salt pans and is a premier destination for those who want to experience both the best and the most extreme that nature has to offer. The flat salt-baked expanse of the Makgadikgadi pans which, with the adjacent national park host seasonal birds particularly during the wet season. When the Makgadikgadi fills with the annual rains, the Pans (Sowa Pan in particular) become breeding grounds as hundreds of thousands of water birds migrate to the area, creating a colorful spectacle. Flamingos and other water birds such as the Pelcans are found here. It rests on the eastern side of the Okavango Delta. 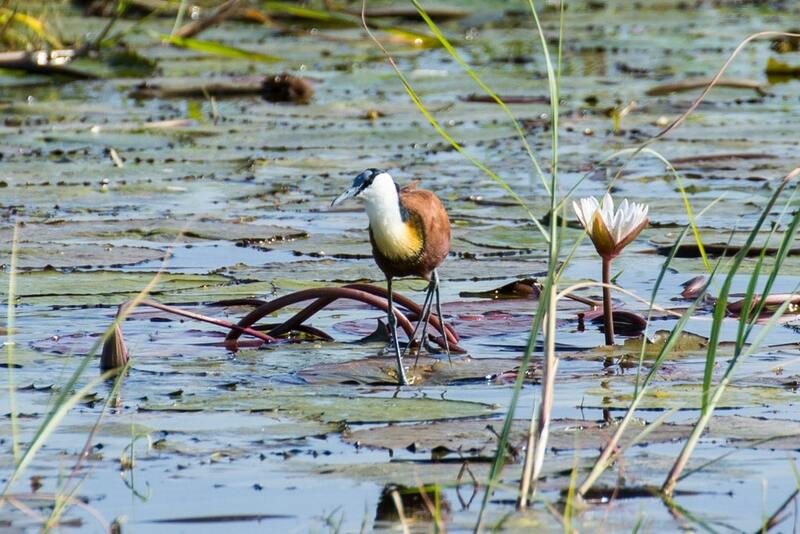 Moremi Game Reserve is home to more than 500 species of birds. This makes it one of Botswana’s prime birding areas. The Pelicans, Ibises, Herons, and Storks are only some of the species. They bring gorgeous splashes of color and sweet melodies to the reserve. The bird population includes many water birds. During the wet season, bird watchers can enjoy exceptional bird watching opportunities when the migrants have returned. Bird watching is best on the Xakanaxa and Gadikewe lagoons. Some of the many bird varieties to watch include Saddle-billed Stork, Denham`s Bustard, Yellow-throated Sandgrouse, Caspian Plover, etc. In Botswana, the perfect time for bird watching is between November and April. This is the rainy season. It is also when several migrant bird populations are returning, and the vegetation is lush and green.